Gobhi Musallam is a super fancy cauliflower Mughali dish that can entrance any crowd when it is plated and brought to the table. It looks very exotic and restaurant style delicacy dish and the best part is, this recipe is very easy and you don't have to stress about it. In Mughali, Mussallam means 'Whole', in this recipe the Cauliflower is marinated with masala and get roasted as a whole hence the name "Gobhi Musallam". This dish is quite popular in North India, if you are in states, this could be a nice addition to your Vegetarian Thanks Giving Menu. With out any due, here is the recipe, Njoy! Soak Cashew Nuts and Poppy Seeds in 1/2 cup of Warm Water. Trim the outer leaves and base of Cauliflower carefully with out breaking the whole cauliflower. Wash thoroughly under lukewarm water. Take a deep pot and fill half with water. Add salt, turmeric powder, chopped garlic and bay leave to water. Immerse the whole cauliflower in it, you need to make sure Cauliflower is fully covered with water. Keep the pot on stove and boil water, for about 10 to 15 min ( until cauliflower becomes tender). Take the Cauliflower out of the water and keep it aside on a plate. Heat non-stick pan, add butter and oil. Once butter melts, add cinnamon and clove. Add chopped green chili and onions. Saute onion for 2 min, then add ginger garlic paste. Mix it well with onions. Add chopped tomato and keep mixing it with onions. In 2 min it becomes thick gravy. Add salt, red chili powder and coriander powder and mix it well into gravy. Add Garam Masal and and chopped Cilantro and close the lid and let it cook for 2 min. Finally add cashew nuts and poppy seeds to the gravy along with water. Switch off the stove. Let this mixture cool, and grind everything into thick paste. Rub this paste on the Cauliflower on all sides. 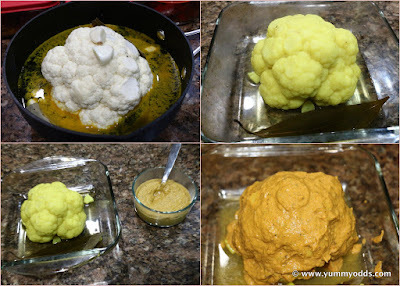 Transfer Cauliflower to a baking dish. Bake for 30 - 35 min, until the paste becomes thick and dry on Cauliflower. Switch off the Oven, Take the Cauliflower out and transfer this to a Wide serving plate and Garnish with Cilantro on top. Chop into pieces and serve warm with rice or roti. Usually Mughlai Dishes are prepared with Cashew Nut and Poppy seeds masala. If you don't like Poppy seeds you can eliminate it, you don't notice a whole lot of difference in taste. Always pick small to medium cauliflowers for this recipe. Blanching Cauliflower is a critical step in this recipe, as this process makes the Cauliflower get cooked on all side and makes it very tender inside. Bay leave and Garlic will give very nice flavor to cauliflower, and turmeric will give nice color. If you don't have Oven, Wrap the marinated Cauliflower with plastic wrap and refrigerate for 2 hours. Then cook it on the deep wide pot covering with the lid on all side on a low to medium flame until the marinade becomes thick and dry. I have added only little bit of Garam Masala as I am serving this to kids as well. If you like it spicy you can increase the Garam Masala quantity per your taste.